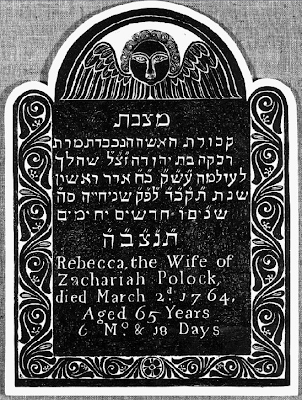 A comment over at Civil War Memory showing a gravestone from New Bern, NC with mixed Christian and Jewish iconography reminded me of the Touro Synagogue Cemetery in Newport, RI. Several gravestones there are embellished with conventional Puritan iconography, despite the fact the they obviously commemorate people who were not Christians. So what's going on here? I'm willing to believe that by the 1760s, the soul effigy had become somewhat divorced from its roots in Christian eschatology and become a formulaic style that said little beyond "respectable gravestone." At the same time, normalizing Protestant iconography is not a totally apolitical venture. I don't know for sure what's going on in that New Bern picture, but I would imagine it might be similar to these eighteenth-century gravestones. One thing's for sure — I won't assume that slaves who have soul effigies on their gravestones were necessarily Christians. I remember seeing a few illustrations from early-Modern (I think) Christian art that was based on earlier Islamic patterns and even had (for someone who can read Arabic) recognizable Koranic verses embedded in the swirl-patterns around the edges -- so you would get, say, the face of the Virgin Mary surrounded by "Allahu akbar." Alas I don't remember any details of this right now. So I think you're right -- templates are templates, and we can just cut out the face of my prophet and put your prophet in its place. Winged head with floral borders -- well, of course, what *else* would you put on a gravestone? The New Bern shot was shocking with a Star of David on a cross. I've never seen that before, though I am sure there's a story behind it. You know much more about grave stone symbolism than I do. 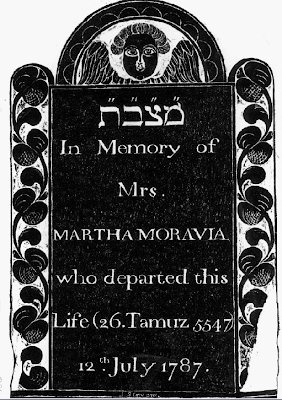 Perhaps in the Touro Cemetery Jews borrowed a soul symbol from Protestant iconography. (We also believe in the soul's immortality.) Or perhaps the angelic icon chiseled above the text is meant to represent the cherubim who, with faces and outstretched wings, were placed facing one another on either end of the Ark of the Covenant which held the tablets of Moses. I can't say I've seen this soul symbol on Jewish gravestones anywhere else in the world. I suspect my first hunch is correct. 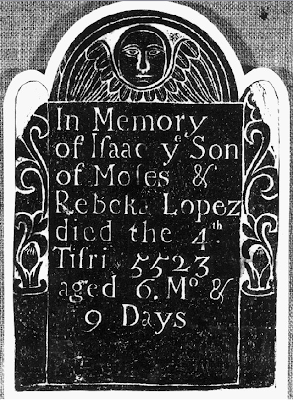 The interpretation of the symbolism on early colonial gravemarkers has been influenced by researchers who have tried linking death with religion. In fact, burial and commemoration was a civil or secular thing in the 17-18th century. In that context the cherub is not a cherub, it is a putto... an allegorical Classical symbol that had been popular in grave art since the Renaissance. English usage of the word cherub has been applied to the putto and has since confused the identifications for a few centuries. By the mid-18th century, more people were economically and socially mobile where they could afford gravemarkers and used the cherub on them to demonstrate that they were a part of the consuming elite and up to the latest fashion. Jewish people in Newport were simply conforming to the fashion and were not using a Judeo-Christian religious symbol. And the Star of David has also been used by Christians as can be seen in the ceilings and other artwork of many European houses of worship. Or the deceased had mixed ancestry... speculation. I use the word cherub to describe these stones because that is the word used in the 18th-century records of the John Stevens shop. The men who made the stones called them cherubs, and I defer to them in my terminology.